Karisalankanni (Eclipta prostrata) finds mention in L G Holm’s 1977 book, World’s Worst Weeds: Distribution and Biology. It is a worthy contender, having the ability to thrive among at least 17 types of crops, including sugarcane, flax, corn, rice, taro, papaya, banana, peanut, soybean and barley, states the book. Native to Asia, the herb spread to countries like France as a contaminant in rice seed. Though karisalankanni is a small wild herb, growing barely 8 cm, spinach-sellers in Chennai supply it on demand. When I was young, my grandmother would prepare porriyal (a dry dish) or thogayal (a chutney-like preparation) from karisalan-kanni leaves. 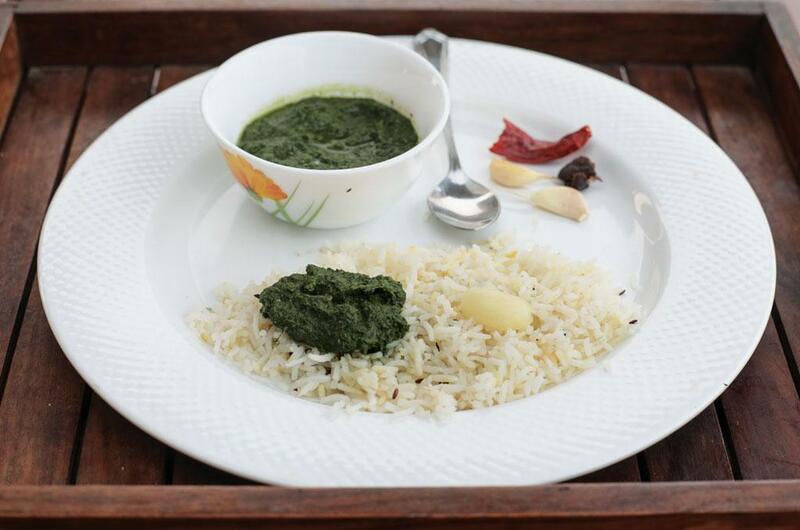 Unlike porriyal, thogayal is prepared from cooked or roasted ingredients. It is generally mixed with rice and served. 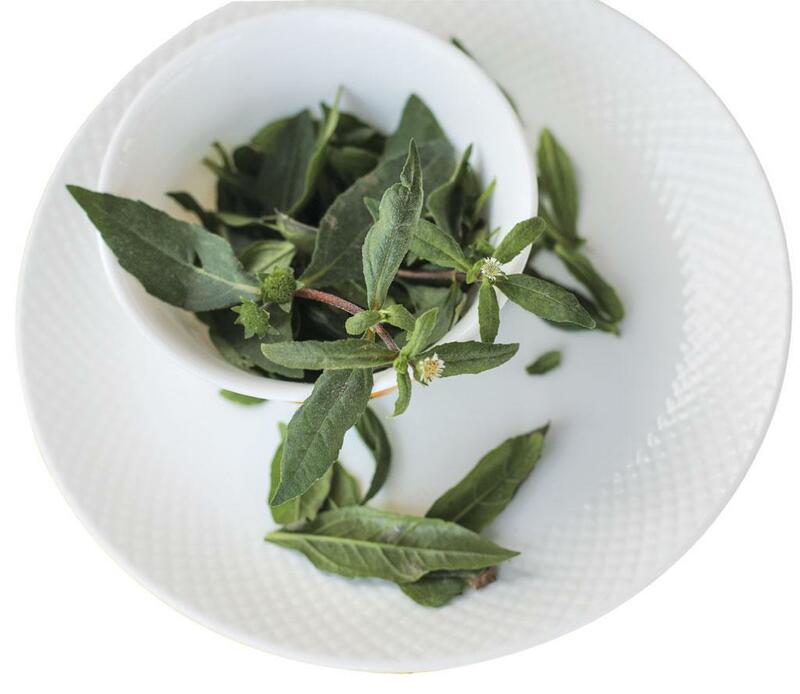 The herb tastes bitter and pungent, but is full of medicinal qualities. Karisalakanni is considered a precious herb by Ayurveda and Siddha practitioners. A non-negotiable ingredient of hair oils, it is used to treat dry scalps. It is said to even cure baldness. This was substantiated by a paper published in the International Journal of Molecular Medicine in 2015. The paper said that extract of the plant stimulates the hair follicle and can be used to treat certain types of alopecia, a condition in which hairless patches emerge on the head and other parts of the body. The benefits of karisalakanni are not limited to hair, though. According to the Foundation for Revitalization of Local Health Traditions, a Bengaluru-based research institute, communities across India use the plant to treat filariasis, boils, wounds, headache, giddiness, lack of vision, indigestion, enlargement of liver and spleen, jaundice, abdominal pain, cough, skin diseases and fever. Irula, a tribal group settled in the Nilgiris in the Western Ghats, uses the leaves to cure malaria. Malayali tribes of Yercaurd hills in Salem district of Tamil Nadu cook the leaves and eat it along with boiled rice. Tribes in the Kolli hills of the Eastern Ghats in Tamil Nadu use the roots of kari-salankanni to prepare a chutney that helps reduce body heat and cure migraine and body ache. Studies have also found that karisalan-kanni is full of adaptogenic properties— it increases the body’s tolerance to mental and physical stress. It is rich in vitamins, minerals and micro nutrients like sodium, magnesium, copper, iron, calcium, zinc and potassium. The herb is available across India, at all elevations, throughout the year. But it grows in abundance at the end of the monsoon and during winter. It is called garagadasappu in Kannada, bhringraj in Hindi and galagara in Telugu. Karisalakanni prefers a clayey soil which can store plenty of moisture. The herb is pan-tropical and the list of countries it grows in includes the US, Indonesia, Sri Lanka, Philippines, Nepal, Laos, Cambodia, Pakistan, Thailand, Vietnam, Malaysia and Myanmar. Remove the leaves from stem, soak them in water for 10 minutes and wash. Heat oil in a pan, add mustard seeds and allow them to splutter. Add onion and saut till it turns translucent. Add green chilli, turmeric and coconut. Sprinkle water while sauting if the mixture is dry. Do not cook the leaves for long. Remove the leaves from the stem, rinse them and keep it aside. Heat oil in a pan and saut the leaves along with chilli till the leaves shrink. Add salt and tamarind,saut for a minute. Crush garlic and pepper in a mortar and pestle. Add the crushed ingredients to the sautd leaves and grind them in to a fine paste. Mix the paste with boiled rice and ghee. Serve it hot.